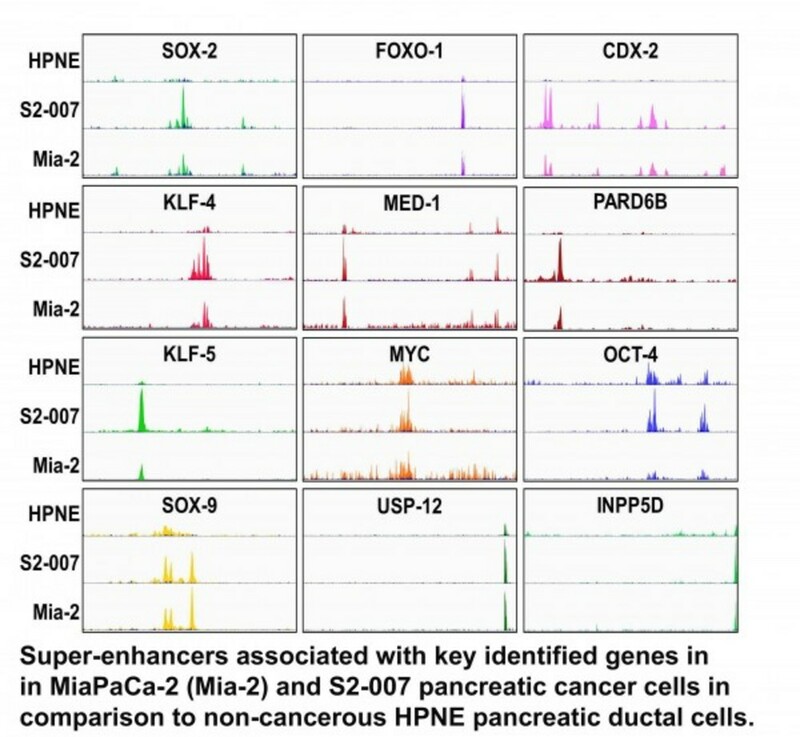 A preclinical study led by researchers at The University of Kansas Cancer Center has identified a region of the human genome, called a super-enhancer, as a novel target for a pancreatic cancer subtype called “pancreatic ductal adenocarcinoma” (PDAC). An enhancer is a section of DNA that can bind proteins to increase the likelihood that transcription – or the copying of a gene sequence to make an RNA – will occur. A “super-enhancer” is a group of enhancers that work together to control the expression of a gene. The study was published in and made the cover of Oncotarget. According to principal investigator Animesh Dhar, PhD, a member of KU Cancer Center’s Cancer Biology research program, PDAC comprises 90% of all pancreatic cancers and is the fourth leading cause of cancer-related death due to its propensity to metastasize. The aim of Dr. Dhar’s study was to identify major specific targets in PDAC and treat those targets with a substance that has the potential to reduce the progression of pancreatic cancer. In animal studies, research revealed how changes to the transcription and enhancer landscape take place during distinct stages of disease. The team subsequently homed in on super-enhancers as a major contributor to PDAC progression and targeted it with a novel mixture of natural compounds, including curcumin – a substance in turmeric. The team determined that the mixture had a significant effect on super-enhancer elements of cancer-promoting genes in PDAC. “By determining the super-enhancers’ connection to the development of pancreatic cancer, and then targeting their regulation with this unique and potent mixture, we have identified a novel approach for treatments,” Dr. Dhar said. Dr. Anant added that researchers can build on these findings to continue uncovering ways to treat PDAC.